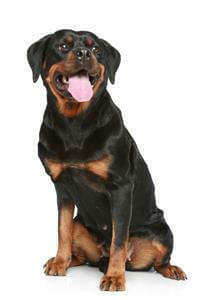 The Rottweiler is considered to be one of the oldest breeds of dog with its origin to Roman times. These dogs were kept as herders or driving dogs. They marched over the Alps with the Roman legions, protecting the people and driving their cattle. Then at the beginning of the 20th Century, various breeds were needed for police service, the Rottweiler was among those tested. It soon became evident that the breed was highly suitable for the task and therefore they were officially recognised as police dogs in 1910. Rottweilers can live up to 12 years of age. The Rottweiler is exceptionally well suited to being a companion, security and working dog. It is self assured, steady and fearless. A Rottweiler must learn, from the start, its position in the family. It is usually tolerant of children, but parents need to make sure that any child is taught to treat the dog fairly and should be actively involved in the dog's education process. As with all working breeds, the Rottweiler needs firm guidance and training. It is of vital importance that early socialising be carried out. This means exposure to all the normal everyday events for a puppy, in a non-stressful atmosphere. This is essential if the dog is to be expected to fit the right action to the right situation when mature. The importance of this early grounding, which must be followed up with regular training, cannot be over stressed. Rottweilers are fast growing dogs and, as such, are prone to all the problems that such animals exhibit, such as hip dysplasia and osteochondritis. The ideal owner is a fit active person who is well versed in dog behaviour, or willing to learn. This should be a responsible person, who realises that this breed must be well socialised and trained from a small puppy.